Do you have a birthday boy who loves man’s best friend? 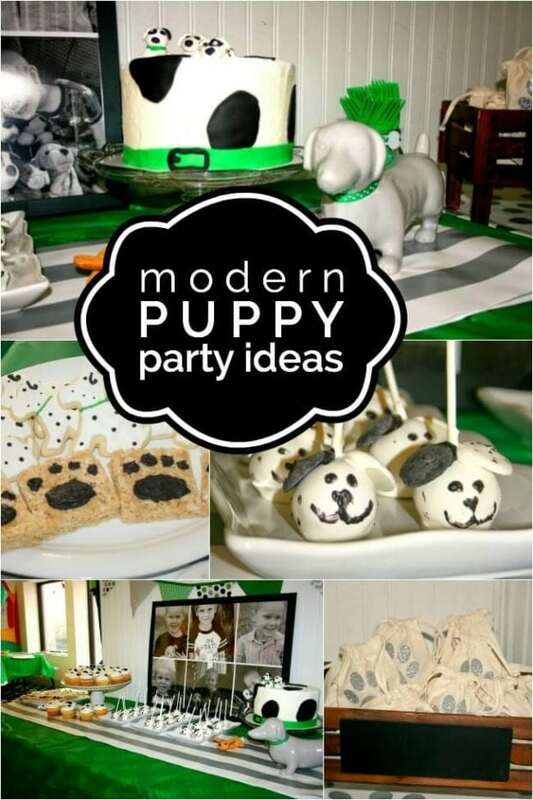 Celebrate with a puppy themed party! 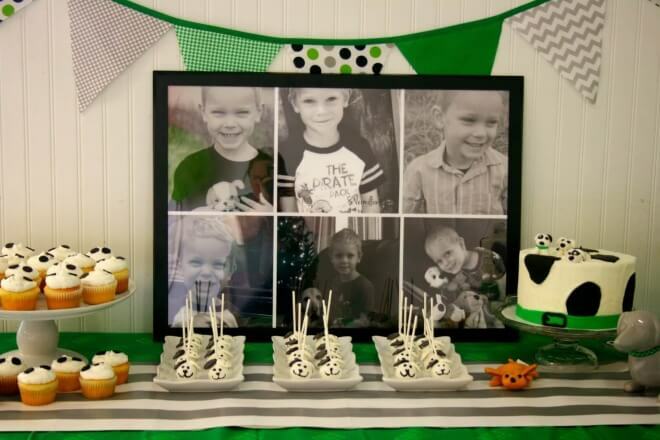 Bone up on these adorable ideas that Toni Thomason, of Creative Designs by Toni, dug up for her six-year-old’s celebration. 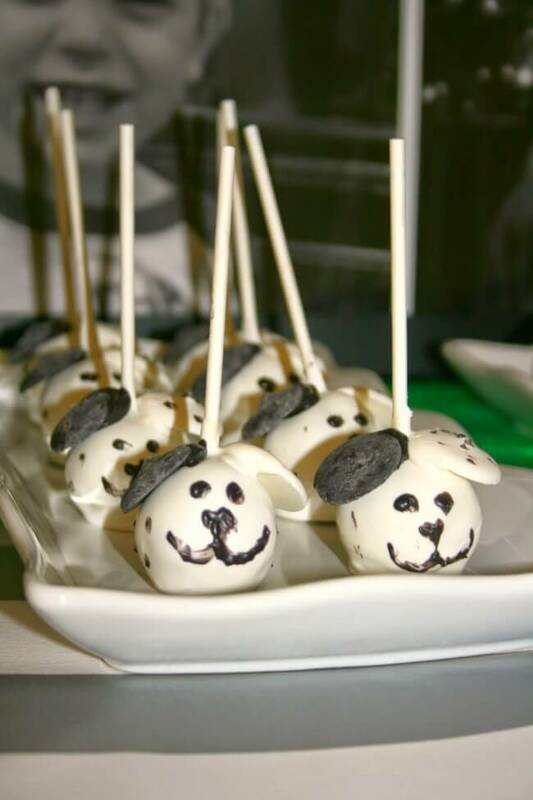 Check out the canine can-do with portable decorations, a dog-gone cute dessert table and custom favors that please. 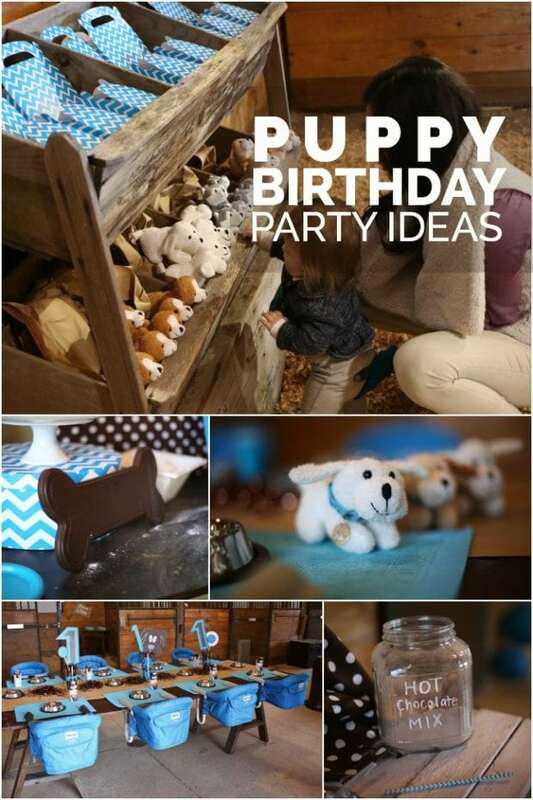 Here’s a delightful first birthday, with perfect age-appropriate, puppy-themed activities. Puppy Paw-ty! Come. Sit. Enjoy. 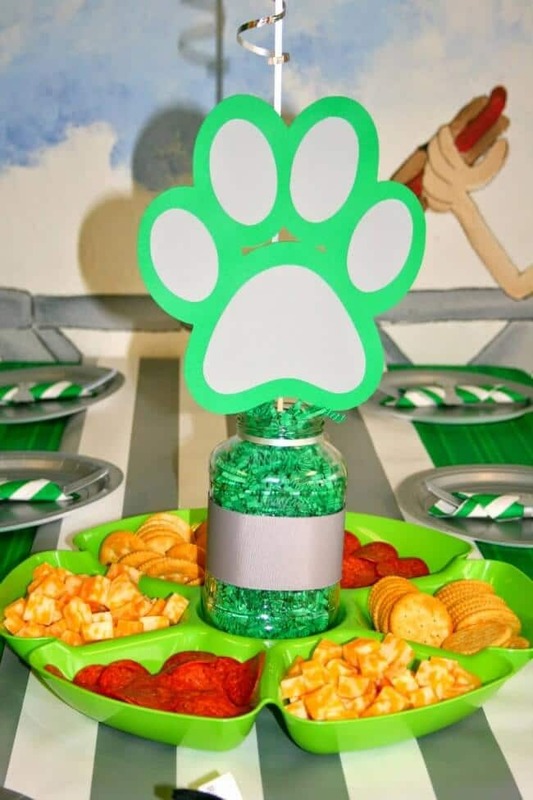 These PAW Patrol Birthday Party Ideas are amazing! 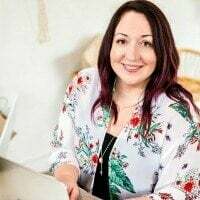 This event was young master Blake’s third dog-themed birthday party and of course a creative mom like Toni was determined to come up with fresh ideas for the celebration. This year, a local party rental space with an indoor bounce house perfect for a pack of 15 energetic six-year-olds was the chosen venue. To give the party a modern edge, Toni used rich green, fresh white, and black accents for the theme colors. 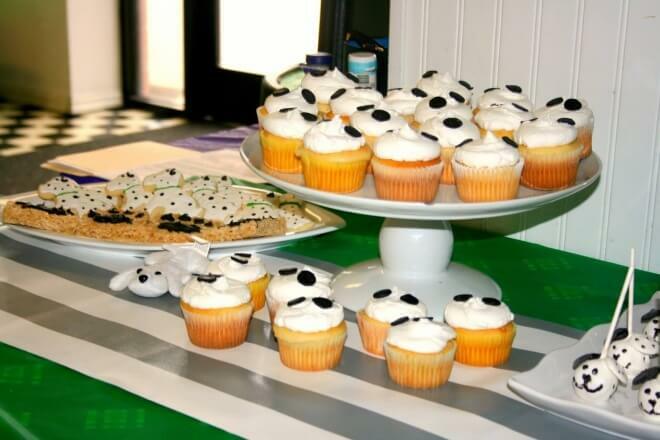 The dessert table wore a green-as-grass foundation that any puppy would approve of! It was also topped with a graphic grey and white striped paper runner. 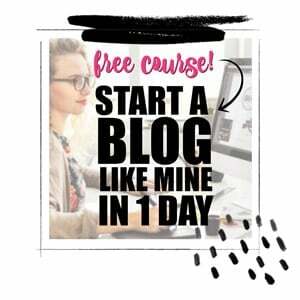 That sort of quick and easy style is one of my favorite ideas, too. The triangular banner over the table added good cheer as well as coordinating colors and patterns. A large frame of black and white photos of the birthday boy served as an excellent focal point. Let’s get to the desserts. How about that sweet Dalmatian-inspired birthday cake? 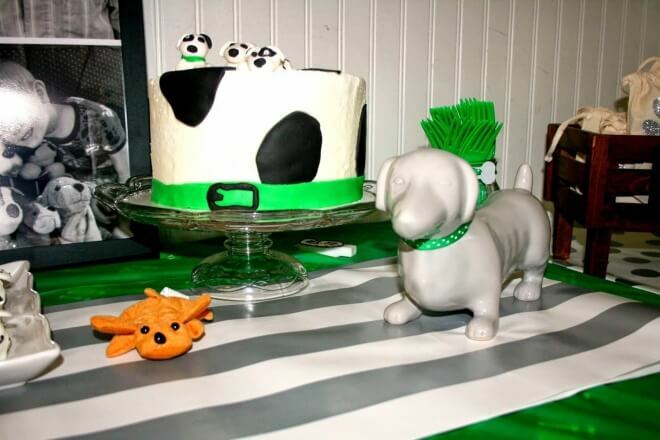 I like the adorable fondant pups frolicking on top as well as the witty green “dog collar” encircling the base. Sweet n Sassy Cakes of Forney created that principal dessert as well as the coordinating cupcakes, grinning cake pups, and awesome cookies. 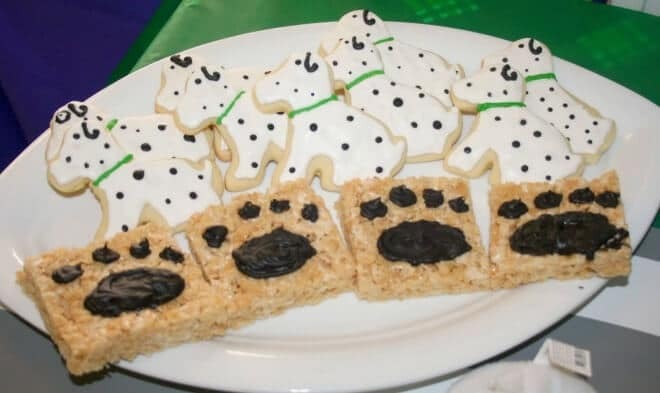 “Muddy” print rice crispie treats added another layer of fun to the table. 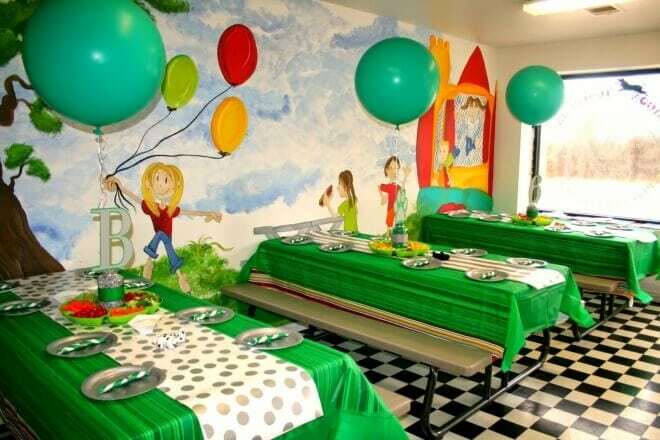 The party room outdoor mural really enhanced the open-air feel of the celebration. And how fortuitous is that black and white checked floor?! 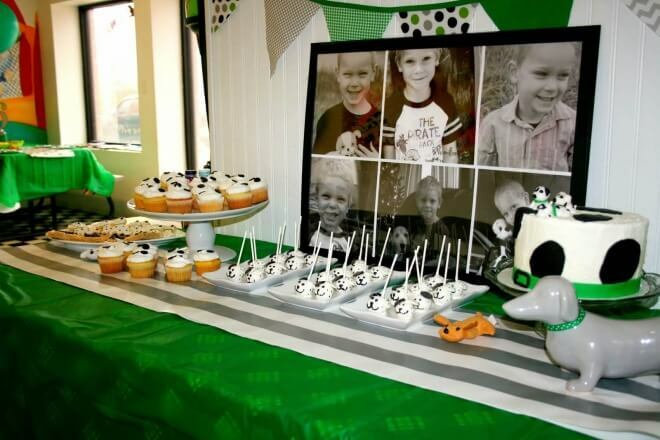 Guest tables were also covered in green with runners sporting grey stripes or giant polka dots. Grey place settings were topped with cutlery bundles in coordinating colors. I especially like the cute little dog bones that Toni made to embellish the cutlery. Although Blake’s favorite pizza was served, every table also offered a tray full of nibbles (fruit, veggies and meat/cheese). Giant balloons punctuated each table arrangement that was made complete with the birthday boy’s initial, age or a giant paw print. 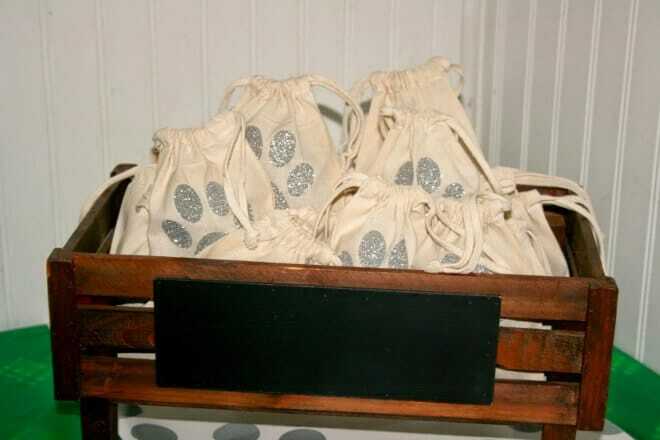 Before heading home, guests were gifted with a custom decorated, glittered paw print bag that Toni designed. 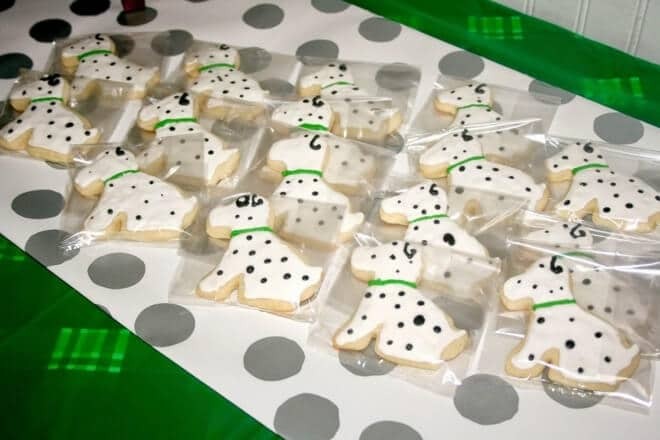 Guests found their own mini plush puppy and a custom made puppy cookie inside. Toni proved, once again, that when it comes to dog-gone cute puppy parties, she’s a leader of the pack!